Using his own footage, videographer George Buck presents an all-color smorgasbord of operating large and very large shovels and draglines. 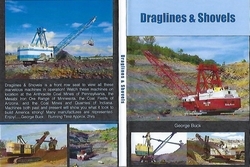 Segments from two to six minutes document over thirty machines ranging from a Bucyrus-Erie 71-B shovel through Marion 5900 super stripper and Bucyrus-Erie 2570-W walking dragline. Playing time approximately two hours.